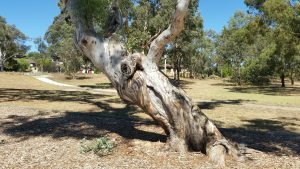 In February 2017, a group of ANTaR ACT members walked around Wanniassa to see scarred trees, and then went down to Tuggeranong Hill in Theodore to see the grinding grooves there. These are reminders of how Aboriginal people lived in the area for thousands of years before more recent European settlers arrived. 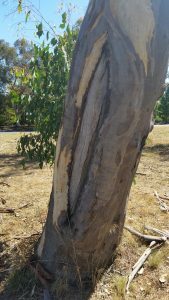 To begin with the scarred trees – here is an explanation taken from: http://www.environment.nsw.gov.au/resources/cultureheritage/ScarredTreeManual.pdf . 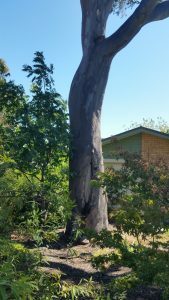 Aboriginal scarred trees are trees that have been scarred by Aboriginal people through the deliberate removal of bark or wood. 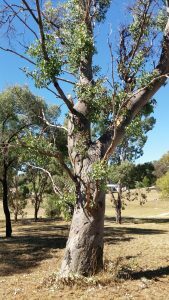 There are numerous reasons why Aboriginal people took bark from trees, it being versatile and plentiful material that could be used for a wide variety of commonplace tasks, including the construction of shelters, watercraft and containers. 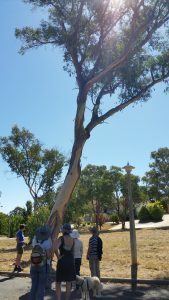 We met at Wanniassa Hills Primary School, starting by walking to 38 Sainsbury St to see a scarred tree in their front yard (above). We then walked further up Sainsbury St to see a scarred tree in the play area opposite Spensley Place (right). From there we headed back to the primary school, where we found the tree in parkland near the pre-school (left). 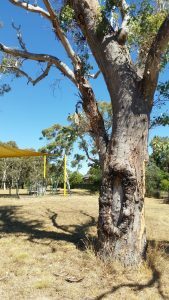 Then we found the Spook Tree (left), in the primary school playground (outside the fenced area, so still accessible on a weekend). We could imagine that many school children have played on that magnificent tree, most probably not realising the significance of the markings. Finally, we found another ancient tree further on in the same area, near Holden Crescent (right). The marking was much higher up than on the other trees we saw. 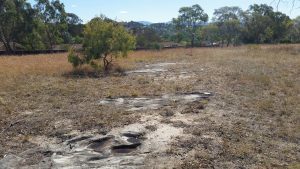 Next we went in search of grinding grooves (above) – this explanation is from: http://www.environment.act.gov.au/parks-conservation/caring_for_ngunnawal_country/grinding_grooves. 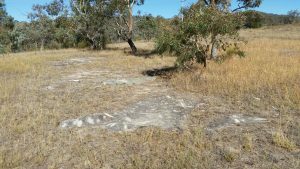 Aboriginal grinding groove sites are rock depressions of various sizes that were formed by the repeated movement of hard stone artefacts against a softer stone surface. This was done to either sharpen stone hatchet heads, stone wedges, hand held ‘axes’ and wooden artefacts with fire hardened points (such as digging sticks) or to grind secondary material (such as grass seeds). 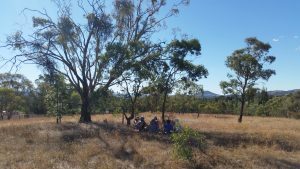 We drove to Theodore, parking in Christmas Street, near a bend next to the start of the walk in the nature park. 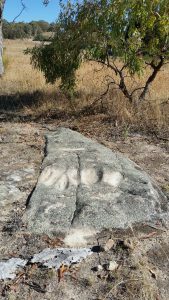 From here, it was a short walk to two very old gum trees and the grinding grooves, where many years of grinding left fascinating markings. A lovely spot for afternoon tea, reflecting on how people lived here before the present suburbia.